With any paint job, the quality of the final finish is directly proportional to the quality of surface preparation done prior to painting. Surfaces must be sanded to a smooth finish and all holes, dings, gaps, etc. must be filled with the appropriate material and sanded smooth. Wooden surfaces must be covered with fiberglass or some form of covering such as nylon, silk, polyester fabric covering etc. and sealed with epoxy resin or dope. Failure to do so may cause the wood to expand or warp, and possibly split along the wood grains due to the water present within the paints. All fiberglass and molded plastic parts should be sanded lightly using a fine-grit sandpaper and washed and wiped clean prior to painting to remove any parting agents and surface residues, and provide a clean bonding surface for the paints. WarbirdColors primers and paints can be applied using either brush or spray equipment. Regardless of the method used, the following guidelines should be followed. 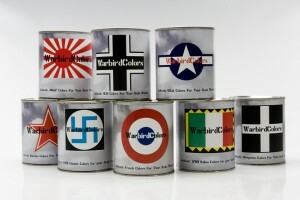 WarbirdColors primers and paints are high-solid, high pigment content coatings. These solids and pigments will settle in the can over time. These solids MUST be mixed prior to painting. It is recommended that WarbirdColors Primers and paints be stirred (as opposed to shaken) to thoroughly mix the solids and pigments prior to any other steps in the painting process. Because of the high solids and pigment content of Warbirdcolors, heavy coats are not recommended. Multiple light coats are recommended, with the last coat being “wet” to provide the optimal finish. Due to the pigment and solids content of these coatings it is recommended that they be thinned, using water, before application. In most cases, WarbirdColors primers and paints should be thinned approximately 10% prior to application. This will vary depending upon the method used (brushed or sprayed), as well as the type of equipment utilized for the application. Conventional spray systems will typically require more thinning than the newer HVLP (High Volume-Low Pressure) systems. Using the newer HVLP systems, it may be necessary to thin as much as 20% before use, while a typical airbrush system using the large tip may require as much as 20-30% thinning. Before painting your model, it is suggested that a sample or test object be painted first to insure the proper viscosity for the equipment being used. Warbirdcolors is made using three different “bases”, each of which contain differing quantities of titanium dioxide, thus different viscosities. The color to be produced determines which base is used, thus different colors will be different thicknesses “in the can”. “PLAY WIT IT” Depending upon the color, and your equipment, thinning may not be required. After painting, clean-up should be done quickly, within 30 minutes, using water. If allowed to completely dry, it may be necessary to use an additional solvent, such as toluene, MEK, acetone, etc., to clean-up. BE ADVISED… Solvents like toluene, acetone, MEK (Methyl Ethyl Keytone), and others will dissolve Warbirdcolors even if it has been dry “forever”. So be careful when cleaning with solvents.